At the Charlotte airport en route to South Carolina, O’Rourke declined to comment Thursday night when asked about O’Malley Dillon becoming his campaign manager. “Just not prepared to talk about our campaign team. Hope to be able to talk about our team soon,” he said. Per the bold-type sentence in the last block quote, immediately above, O'Malley, prior to starting her own business just a few years ago, was the quintessential Democratic Party insider. However, without question, she's one of the most highly respected political p.r./strategy consultants in the industry, right now. Her firm includes companies such as Facebook and GE on their client roster. But, also without question is the fact that she's going to have her hands full on this effort, assuming CNN's latest scoop is accurate. The joke at Gino's Cento Anno, a blue-collar dive on the south and windward side of Cleveland's industrial valley where Democratic presidential candidate Beto O'Rourke made a pit stop Tuesday, was that two hours before his scheduled arrival, the TVs were all playing Fox News. By 3:30 p.m., the planned start time for O'Rourke's remarks, they'd been switched to CNN. And by 4:00 p.m., right before the erstwhile punk rocker and Texas Senate candidate began to gesticulate before a jam-packed crowd, they'd been tuned to MSNBC. [GOP's STEVE KING SHARES MEME OF MODERN-DAY CIVIL WAR], the chyron read, as Beto was welcomed by Cuyahoga County Democratic Chair Shontel Brown. Hopped-up members of the crowd, chanting "BAY-to, BAY-to, BAY-to," were coaxed by frantic, Patagonia-vested campaign volunteers to please chant "BEH-to, BEH-to, BEH-to." "They keep moving to the Left," a wisecracking cameraman observed above the din, nodding to the TVs. Beto's political movement is less clear, in large part because his initial position is still somewhat vague. But in a high-energy campaign speech framed as an in-person introduction to local voters, and in answers to questions from the crowd, he presented much as he did on the Texas trail: an "authentic" charismatic Gen-Xer who absolutely loves Rock 'n' Roll and wants to make America a better place. O'Rourke spent 20 minutes earlier in the day at the Rock Hall, in fact, and opened his speech with a celebration of the ingenuity of America's musicians. No one could argue with the things this tall, lean man said he wanted: affordable trips to the Doctor for everybody; a fairer criminal justice system; humane immigration policies that welcome refugees and don't lock children up in cages; a belief in science (!) and the need for bold action on climate change, etc. But the criticism from the Left that O'Rourke is a bit of a nothingburger — "neither a bold progressive nor a distinguished legislator" — was difficult to dispel on first blush. He advocated for very few specific policies, though he did gesture toward the full legalization of marijuana and a bunch of stuff concerning "the VA," and in many areas where Democratic candidates have staked out aggressive progressive positions, he proposed what might be deemed "pragmatic" lesser measures. On gun control, for example, speaking to a cohort of Moms Demand Action attendees in their trademark red shirts, O'Rourke said he wanted universal background checks — obvs — but then said something extremely weird and contradictory. He talked about what a bad idea it is to have military-grade assault weapons in our communities. These are weapons, he said, that "could blow a hole out of your back so large, destroy the insides of your systems so much, that you'll bleed to death before [a doctor] can save your life." O'Rourke warned the crowd that what he was about to espouse was a "much more difficult" issue than something palatable like universal background checks. It was this: "If you own an AR-15, I don't want to take it from you. Keep it. Use it responsibly. All I'm saying is that we don't need to sell any more of them in our communities." Again, there are 5,000,000 AR-15s in the United States, alone! 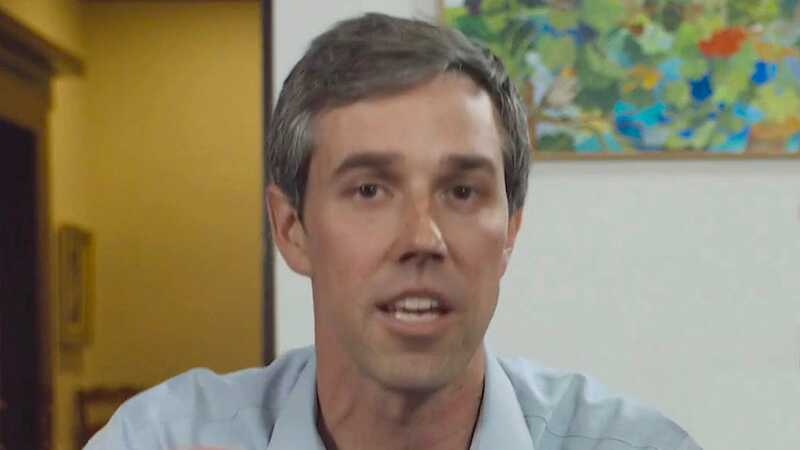 So, what does Beto do? Apparently, Beto just keeps smooth-talking out of both sides of his mouth. In his neoliberal mindset, it's OK to leave 5,000,000 AR-15s out on America's streets. ...On health care, he doesn't want Medicare for All, necessarily. He just wants it to be a bit more affordable, maybe by putting the Medicare option on the public exchanges for people who don't have, or aren't happy with, their employer insurance. On college affordability, he doesn't want free public college, necessarily. He wants to refinance student loans at lower rates. When asked about the structure of the Supreme Court, he literally threw out a few rhetorical questions — Do we let an equal number of current Democratic and Republican justices select new members? Do we expand the body? Do we impose term limits? — and said he was partial to the option (term limits) that had generated the most applause. But the Gino's crowd was largely receptive. (What he proposed would be improvements!) The chatter among attendees before Beto arrived, though, seemed to describe curiosity more than ardent support. Given the current occupant of the White House, local Democratic voters are ready to be energized by national politics. And honestly only upon review did the candidate's wishy-washy positions become clearer (other than the AR-15 comment, which was instantly a head-scratcher). In the moment, and in the excitement of the crowd, he sounded courageous and idealistic and hoarse from the fervor of his beliefs. He was a handsome, sweating politician in peak physical shape who had no qualms whatsoever about repeatedly name-dropping Sherrod Brown for the Cleveland crowd. And people were enjoying themselves. Beto's style's about a decade late--younger voters are far beyond this 2008 con--but he sure as hell doesn't look like he'll be a dollar short. It's no wonder Obama staffers are flocking to him. How they play this will be interesting for sure. I really like that tagline! In the era of say-a-lot-of-feel-good-stuff-without-tipping-your-hand-and-look-good-saying-it political campaigning, the distinctive difference so far between BeStillMyHeart O'Rourke and Obama is that Obama was actually smart, poised, and could turn a good phrase even without his own speechwriters. ...within just over a week after coming out of the gate. political media darling that consultants wanna market to the general public but in reality he's all hat and no cattle? us. Beto could be the next one. @bobswern I loved this tweet about Beto. #1 I loved this tweet about Beto. So he's the real sheepdog, not Bernie. One remembers that last sheepdog we were granted. Hillary Clinton believes that strengthening the middle class and alleviating income inequality will require “toppling” the wealthiest 1 percent of Americans, according to a New York Times profile published on Tuesday. Yeah apparently she said something to that effect back in April of 2015. Will there be an O'Rourke version? ...and Hillary. But, with a touch of Obama, too. And, frankly, I think a LOT of voters--especially young voters--are way past that, nowadays. Then again, maybe not. @bobswern We won't get fooled again. Out of the same cracker jack box. Harris is black Hillary, and Beto is white Obama. It was pretty well known from his first flash in the pan, Beto was coming out of Obama's camp. I'd rather have Trump in the White House than Obama and his crooks back within a million miles of the White House. I despise Obama more than any other President or public figure of my lifetime. He is truly slime. @bobswern @bobswern will see through this Beto crap. He is just some guy who likes to jump up on and stand on furniture while gesticulating and saying nothing. No wonder the Obama crowd is flocking to him. Guaranteed to get lots and lots of corporate money with those antics! #2.1.1 #2.1.1 will see through this Beto crap. Blofeld is looking pretty good now. Don't worry, I'm not spamming you. It's just that when they call Jen O'Rourke "one of the party's sharpest data experts," I have to wonder what that means. What's a "data expert"? Someone who controls huge databases wherein obedient flunkies can be summoned who can staff underground lairs within extinct volcanoes? Was BLOFELD a "data expert"? And certainly it is an act of villainy to work for Beto O'Rourke. No? Professionally, I have lots of respect for Jen O'Malley Dillon. OK so -- if I were to find an extinct volcano somewhere in the world and if I were to find the funds necessary to hollow it out, you'd be able to summon flunkies for me? Sure! I know tons of flunkies! Absolutely! @bobswern if there's a Portland meetup. LOL! I'll send my resumé! What's Oregon's minimum wage? Do they have a political workers union? And, aside from being able to meet you, in person, what other benefits are there? #3.1.1.1 if there's a Portland meetup. give you their respect and kudos for you to find them important enough to meet them in person? Isn't that a nice benefit? They may become your best friends and honestly one can't have enough of them in life, at least if they don't fake the friendship. Cheers, hope you can live with those minimum wages. If not I am willing to fedex some German Würschtls and St. Pauli beer. Have fun working for whoever's campaign. When I was new to the US it took me a long time to understand why there are people, who work as consultants and advisers to a candidate that runs for office. That was back in the eighties. I wasn't aware of something similar back in Germany in the seventies. Imagine that I got it somehow during the early 2000. Some folks are a little slow. That is life. "...May be the handful of people who show up will give you their respect and kudos for you to find them important enough to meet them in person? Isn't that a nice benefit?" I'm blogging in a place where everyone has their own opinions about players in a sector of our society where I've worked, professionally and fairly extensively (but, almost exclusively and intentionally, very much behind the scenes), at different times in my career. I haven't done much work in that space over the past decade, or so. But, I've learned a lot along the way...and a lot of what I learned wasn't pretty. It can often be a very ugly business. Thankfully, the public's getting more and more attuned to what's going on behind the scenes. And, ultimately, if society doesn't destroy itself in the process--and that IS what's happening as we blog, of course; we certainly are reaching a tipping point, here in the U.S.--that could end up being a good thing. what was not nice in your opinion, the expression "handful of people"? I just meant to say that it is always good to see, listen and talk to people in person and that it is nice if a person who does not have any financial advantage to engage with other people, nevertheless does engage personally. I thought you would take that as a compliment. I am a little confused. And, ultimately, if society doesn't destroy itself in the process--and that IS what's happening as we blog, of course; we certainly are reaching a tipping point, here in the U.S.--that could end up being a good thing. I read that as you saying it is a good thing if society is destroying itself? Probably I misread this. Again I am confused. I wonder if Jen thinks she's actually using her considerable skills for good? I'm still trying to find the considerable skills. The Democratic Party was in free fall while she played a major role. Maybe her stroke of genius was stealing all the money from congressional, state and local candidates and inserting it in Obama's coffers. ...from January 2009, onward, for about a year, I believe. (Tim Kaine was the "Chairman" [mouthpiece] of the DNC during that period, but Dillon, as Executive Director, was responsible for running the day-to-day/administrative side of the organization.) Essentially, she deserves at least some of the blame for the Democratic Party losing so much ground in the House and Senate in 2010. Of course, the fact that the new administration decided to lend trillions of dollars to Wall Street, thereby exacerbating the ill effects of the Great Recession, instead of doing a more effective job of ameliorating it by pouring more bucks into Main Street, was a much greater part of the reason as to why the Dims were hammered so badly in those (2010) midterms. @bobswern One of those folks who basically believes that it doesn't matter who controls government as long as capital is in power. ...lots of successful dataset modeling experience when it comes to the actual implemention of analytics (scoring variables, etc. ), within their chosen field(s) of expertise (i.e. : politics/public issues, consumer behavior, finance, human resources, etc., etc.). Personally, I specialize in the creation and delivery of the scoring systems/platforms; others specialize in the content. This is how I imagine it. @bobswern There is a room somewhere in the world, probably underground. A legion of flunkies staffs the room, and operates on paid eight-hour shifts on computers and on telephones. The flunkies contact more flunkies, asking interview questions such as "when can you work for Mr Blofeld?" and "when can you have the unquestioning obedience chip installed?" The flunkies in the underground room rotate with other flunkies staffing office buildings throughout the world, where obedience chips are installed. You are applying to be the guy who coordinates the operation. Right? ...but, that's OK. My political work has been mostly media-related. My analytics experience primarily relates to consumer behavior/finance/credit. Do I understand political polling nuts and bolts, methodology and technology better than the average person? Yes. But, that's about it. #3.2 There is a room somewhere in the world, probably underground. A legion of flunkies staffs the room, and operates on paid eight-hour shifts on computers and on telephones. The flunkies contact more flunkies, asking interview questions such as "when can you work for Mr Blofeld?" and "when can you have the unquestioning obedience chip installed?" The flunkies in the underground room rotate with other flunkies staffing office buildings throughout the world, where obedience chips are installed. @bobswern if Mr Blofeld needs one of those. Why is everything so complicated in America? Why do everyone has to compete and sell him/herself to be taken seriously and/or getting some money for survival? It's that different for politicians in Germany? regulations are different and we don"t have an electoral college and no super delegates. That makes it not that necessary for candidates to hire consultants at that intense level as it is in the US, because of the lack of extreme competition among candidates. At least I think so. I am only two years back, and might not understand yet what is going on in Germany, but I see more open-minded panel discussions on German mainstream TV than I have seen them in the US. I worked for five years in Germany as a analyzing statisticion in the field of environmental toxicology at the equivalent organization to the NIH in Germany (Bundesgesundheitsamt) after graduating. I found GU's fast-paced progarm kind of exhausting in some classes, but very interesting and failed to finish, because a multicultural family in a third culture host country, a mixed-race-cultured-schooled child in a third culture at age 12 and a profound culture shock on my side was a little too much to have on top of the studies. So, I broke down in my last class to fulfill all credit requirements of the program, in an anxiety attack, because I couldn"t figure out one problem to hand a paper in on time. I also was not used to pay tuition for my studies, of course I knew that in the US you have to pay tuition for university level studies, but how that really feels like, I learned only at GU cashiers office, when I was supposed to put a couple of thousand dollars on the table out of nowhere. I had no money, hadn't yet a Green card (and therefore were not allowed to work), so I had to beg and ask for money for my studies, soemthing I never needed to do in Germany and did not like to do in the US. I regretted later on (after I got my Green card in the lottery) very much that I gave up a couple of yards before the finish line. What I learned in the US was that what I was able to do in Berlin (making my MS in Physical Chemistry with no money and no family/partner support and a baby), I would not have been able to do in the US. So guess what, tuition free higher education in the US is an important issue I support, no buts and ifs and any weaseling aournd it with half-hearted solutions. So for whomever you work for on the campaign of a candidate, tell them they can't mess around with tuition free higher education. Honestly, if European countries can do it, why can"t the US? I think my way of being a little ironic or sarcastic isn't quite understood. I guess that's a lack of my language expression capabilties on my side. Sorry for that, bobswern, I meant it well. ...having interacted with you many times. And, given the new, personal info you just provided, that gives me even more depth into your personal situation. I state this within the obvious context that "knowing someone" online will never, ever come close to replacing the real thing. And, I know your intentions are quite sincere. That's why it's all good! As for the info you just provided, that just enlightens me more, as far as you're concerned. And, I'm sincerely sorry to hear of the obstacles you had to contend with here, as far as furthering your education and dealing with your family life were concerned. Hope all's well on the family side of things, these days? Interesting to hear about your statistics background. I have great respect for those in that field of study! it was a good one and had just some circumstances that others seldom have. All is well. And compared to many I have seen and witnessed in my life, I am very well off. I am used to get the reaction (unspoken or not) for all those things I didn't like. I should blame those all on myself... I didn't have to do what I did some 52 years ago. In my mind I still think of them ... something someting something ... On my family side things are well. Most are dead by now, tensions of the past resolved themselves by nature. Thank God, all has an end one day. Btw, though I read TOP since 2005 and remembered your name, I don't remember really what you said on TOP. I matter of factly do have a bad memory and it is worsening. Even here, I have difficulties to remember who said what on which subject. I hate it. I remember from my mother that she also was upset about herself, when she realized she wasn't able anymore to put events and conversations in the context of a her life's timeline (and I see this similarly now in my 76 year old sister, who isn't aware of her condition). My mother was aware about her deterioriating condition, but couldn't do anything about it. I am curious about whose campaign you will support and work for in the upcoming months and year. So, let us know ... I of course can't disregard, who of the candidates has the better 'hair, teeth, chest and smile' ... but I get into the potty mouth territory with that. Back in the fifties my Berlin based and rooted family used to listen to the 'Voice of America'. They listened but mocked it as a pretty darn propaganda radio station at the same time. As I didn't grew up there in Berlin like many of my extended family, who went throught WWII, and did stay in post-wwII Berlin, I knew nothing personal about the 'Vocie of America', just remember that many of folks there were able to distinguish propaganda and fake news from the real conditions. But you know they 'liked Ike' and 'Ick bin een Berliner' and the chocolates US GIs gave to the German kids in the early days and years after WWII. Later on, my father, who was a POW in Russia for three years, just said that Hollywood made pretty bad movies (as in ridiculing the severity of the Third Reich with comedian style jokes about Hitler, Nazi and Co.) So, the effects of Hollywood and the media was always in the conscience of many West-Germans. Whatever, propaganda here and propaganda there, as long as you recognized it is propaganda, all is okay with us Krauts and Uncle Sam and the Russian Tatars. And we are all bribable for a little tip and a happy end. ...and notes about your philosophical views concerning life and family. And, yes, we've communicated about this outside of this blog, too. So, I know you've been through a LOT. Keep on keeping on, Mimi!!! As for me, I haven't done any political media work, professionally, since 2006, give or take. I have provided some political media-related volunteer services, locally, since then. But, that's about it. (Political media campaigns are a really intense grind, frankly...up at 4:00-5:00 AM, working 'til 9:00 pm, or later, many nights every week, etc.) And, I haven't focused upon the sector, exclusively, for at least 30 years. (I have handled various political accounts during my career--including names folks here would recognize--but, frequently doing so in the context of managing other media accounts/business, concurrently.) All my life, I've done p.r./advertising/media for all sorts of entities (ad agencies, p.r. firms, community org's, Fortune 500 co's, and pretty much everything in-between). Over the past 20 years, I've also/concurrently been in the analytics business, as I noted, above. I think there are some campaigns, who would love to draw from your professional experience. So, if I had the money and skills and role, I would hire you to support Tulsi (in combination with Bernie and even Warren) to help them get rid of the ... all the others. As simple as that. Really. the same as your, Bob - Obama, Jr.
On another note - folks - be aware of this new ploy by the DCCC to restrict the possibility of actual change! There are 20 people reading this that already know this is a funny, off-base comment. I'm about as far away from "Obama Jr." as it gets! What I meant is that, Bob, I agree that Beto is Obama, Jr. Sorry I spoke in shorthand. I thought you'd get it. ...especially about the economy and our surveillance state, over at DKos. indicated I think you are not what you are. I also don't believe you get what I wrote, so I'll drop it. Have a good day. ...and I now realize I misinterpreted your sentiments. So, shame on me! Thanks for subtly urging me to read your comments one more time! Sincerely! Have a great weekend! Vacuous Texas rich kid pretends he's a man of the people. Right down to the coke spoon nose. @Not Henry Kissinger Would appear on the grammar section of the SAT. #4.2 Would appear on the grammar section of the SAT. Does this mean . . .
@Raggedy Ann any consulting firm that supports the challenger to Tulsi Gabbard is going to be cut off? @FuturePassed I suspect the DCCC will make an exception in Tulsi’s case. Cant imagine why, right? But seriously, the DCCC is nothing more than a protection racket for incumbents. So very democratic of them. #4 any consulting firm that supports the challenger to Tulsi Gabbard is going to be cut off? at least they're being transparent, right? Huh? Right? #4.3 I suspect the DCCC will make an exception in Tulsi’s case. Cant imagine why, right? of the Party has revealed itself. The Hillary wing seems to be set on Kamala Harris, or maybe the Queen Herself. The Biden Wing is about to announce. At what point do they coalesce into the anti-Bernie wing? That is the game they play. Ad Infinitum. @jobu Bob has it right. One thing Bernie did was to condition all types of voters is to focus on substance. And Beto is getting ripped because people are like checking his voting record. Bernie never talked the horse race, and always said concrete fundamental stuff. The marketing of Obama cannot be repeated over 12 years out. At some point yes, establishment forces will unite around an anti-Bernie candidate. It will have to be soon so the party infrastructure knows who to cheat for. And therein lies the problem. While I believe Bernie was cheated, Hillary still would have won. Only margin would have been less. So the critical point is who will capture the majority base which is what I would call liberal Rockefeller republicans. ...but I knew/know of a lot of Rockefeller Republicans who were/are significantly to the left of many of today's centrist and rightwing Democrats. #5 Bob has it right. One thing Bernie did was to condition all types of voters is to focus on substance. And Beto is getting ripped because people are like checking his voting record. Bernie never talked the horse race, and always said concrete fundamental stuff. The marketing of Obama cannot be repeated over 12 years out. of his mouth with regards to assault rifle no-ban bans. No thanks. I think it's funny that campaigns try to find out what voters want to hear and then their candidate tries to feed them what they believe the population groups like. It's a strange concept. I would expect a candidate to have standards convictions and view points and tries to express them and the voters can tell them go to hell or yeah great. The candidate would stick to his view points despite of not getting the population to agree and not weasel saying one day this and the other day that. @mimi This is the collaborationist party. Having opinions is for Republicans. happens, isn't it? Sounds like the electoral version of "nobody could have predicted". As in,"Nobody could have predicted that a corporate centrist with a progressive message would show up out of nowhere and set the party on fire." Strange to see it AGAIN. I'm sensing a pattern. Maybe that's how you get "an outsider" today. ... until the tactics quit working. Losing to a Republican doesn't mean it didn't work, losing to a progressive means it didn't work. The candidate with the most money doesn't always win, though they frequently do. If two candidates run similar, money-intensive campaigns then the one with the most money usually wins. Even then, all the money in the world can't drag a dreadful candidate across the finish line. So far it looks like O'Rourke is a top tier money raiser, but a mediocre campaigner. Will he improve on the campaign trail? Maybe. Have voters actually matured and are looking at policies and substance instead of media image? I would like to think so, and O'Rourke may have trouble with those voters. The bright side of this is that with three top-tier centrist candidates, plus a bunch of third-tier candidates, splitting the centrist vote Sanders may be able to build up a cushion of delegates before the inevitable shake-out occurs. Voters swayed by Facebook ads and tweets? Have voters actually matured and are looking at policies and substance instead of media image? New flavor of your favorite brand? ...outstanding, for yours truly, to see this EXCEPTIONAL piece of media in a comment in this post. I will definitely borrow this! It's so powerfully spot-on, no other commentary's necessary! Thank you very, very much! there's no way you're going to settle for vanilla! ...but empty platitudes are the real drug! Hope you both have a good weekend. I'm out the door... off to my weekly session. or "the truth about him". Here's a must read and share article about him. O’Rourke is hardly eager for those upcoming voters to realize that the growth of his political career is rooted in an alliance with powerful Republicans that began 15 years ago. Or that he supported raising the minimum age for Social Security in 2012. Or that—during six years in Congress, through the end of 2018—he often aligned himself with Republican positions. If facts matter, such weighty facts could sink the “Beto for America” presidential campaign. Since his announcement, information gaining traction nationwide runs directly counter to the Beto brand. "The more you get to know him, the less people like him". That said, if Betos going with the Clinton gaggle of "advisors", I feel a little bit sorry for him. I expect it won't be much different than any other Clinton based endeavor.